When I have an idea, I tend to tell a lot of people about it, gather opinion and then refine it until I take the idea to Wifey Nadia, eventually getting the go-ahead to pursue another of my crazy capers. In October I went to Las Vegas to celebrate my 28th birthday with my wife and friends Matt, Neil and Gina. Nadia had yet to arrive, but our tight schedule dictated that my birthday dinner be eaten that night, the day before my birthday, because I had tickets to a concert on the day of. 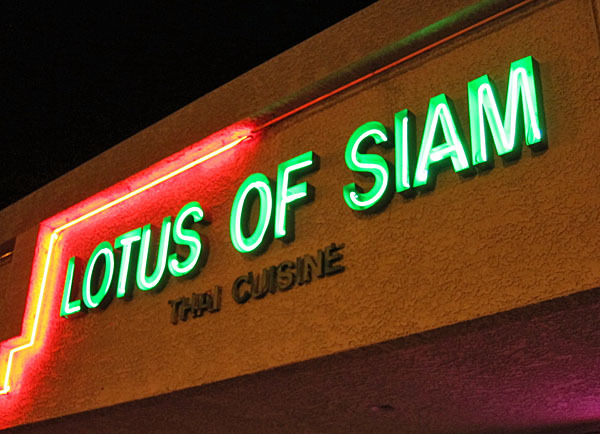 I chose the finest Thai restaurant I’ve been to, the off-strip Lotus of Siam. The restaurant has been praised in Gourmet magazine and received a James Beard award, but those laurels aside, this is simply one of the finest Thai restaurants around. While waiting for our meal, I began rattling off my ever-morphing idea for a weight loss blog to Chef Brian and his girlfriend Daga. The original plan was to cook recipes from various sources around the Web, but almost immediately Brian chimed in, wanting to get in on the action. Over a smattering of dishes, we formulated what would eventually become Fat Dude on a Diet. If you’re in Vegas, plan a stop at Lotus. You won’t forget it.